EURO MOTOR WORKS IS PROUD TO BE A MEMBER OF MOTOR TRADE ASSOCIATION (MTA). We are experts in general auto servicing, WOFs, repairs & inspection of all kinds of European motor vehicles. Based in Manurewa, Auckland. We have experienced technicians readily available to handle your requests/ vehicle problems professionally. Euro Motor Works is owned and operated by Raj Lal who is an experienced auto mechanic. Before establishing Euro Motor Works , Raj worked for more than 20 years in auto industry in Auckland. His genuine passion and in-depth knowledge allows him to take great pride in his work, which in turn has resulted in building a large and long standing customer base that continues to return to the company for all their vehicle repair needs. specialists for PEUGEOT, CITROEN and RENAULT. From SERVICING, BRAKES, ENGINES, ELECTRICAL DIAGNOSTICS, REPAIR WORKS, SUSPENSION ISSUES to MINOR CHECK UPS, WE DO IT ALL! We are trained and experienced to take any job, engine work gearbox problems to minor brakes services and oil service. Our main goal is to help you whatever your car need and we aim to provide this in the quickest and easiest way to solve problems efficiently and get you back on the road ASAP. All of our customers are treated with loyalty and can trust us to do the job right without throwing in any extras. We handle your vehicle with the same respect that we would like our own cars to be treated and can provide your petrol or diesel vehicle with an efficient, cost-effective service, whilst ensuring that all work is completed to the highest standard. We examine all vehicles very carefully to give you an honest appraisal of the work required. All services are delivered with a personal touch and by highly experienced and suitable qualified mechanics. Whether your vehicle is ready for a service, WOF or has been damaged in an accident, or simply needs a minor repair, our team offers you a complete same-day service. If you are from Manukau or from another surrounding area in Auckland, Euro Motor Works should be your first stop when seeking automotive service. Contact us online or visit our auto service centre today when you need complete car care that’s close to home. To Reduce Stress, costly breakdown and save our customers time and money. What makes our business unique? Provide a competitive warranty of 1 year or 20,000 kms. I met Raj when I discovered that he was opening up his own business after time at Auto France where he has long been working on European vehicle’s. The owner of Auto France readily recommended him to me. Not only is Raj an experienced “Euro” Mechanic …. Importantly, he is honest and helpful too. The CAM Belt on my Peugeot had gone. I was agonising over whether to scrap the car, get a top end engine rebuild, or get another used engine, fitting new CAM/Drive Belts etc. His advice was the second hand Engine re-fit. He sourced it and checked it out for me. He checked my transmission. He was thorough and gave good honest advice. I am very thankful for his skill and guidance. He also kept the works as economical as reasonably possible for such a major job. My car is now going well ….and I have found myself a good Mechanic. Only wish I had known him earlier. Might have avoided my woes. I am happy to recommend him as reputable, skilful and dependable. You can’t ask any more than that. Thanks Raj! I have been using the services of Euro Motor Works for several years now. Raj has been very thorough with all the servicing and maintenance on my vehicle. 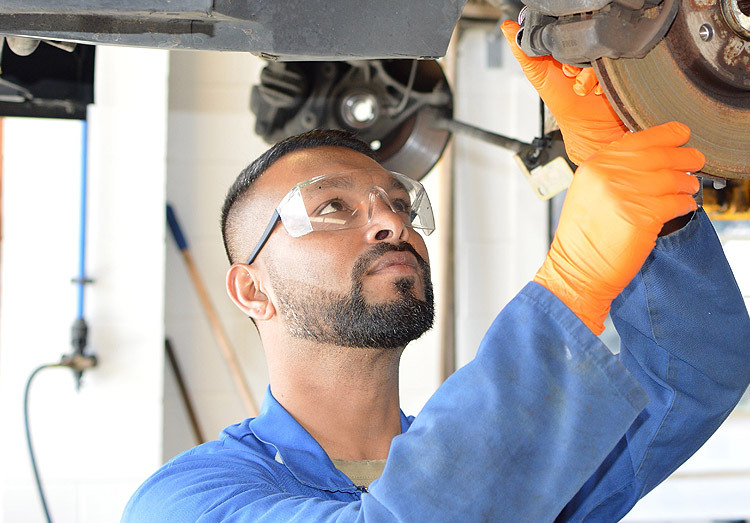 I am always advised on the current state of my vehicle and if any further work needs to be done Raj has always given me various options and has suggested the best one for my requirements and usage. The service has always been friendly, courteous and prompt. I would highly recommend using the services of Euro Motor Works. I have known Raj for several years, initially when he worked at Auto France and then, latterly, at his own business; Euro MotorWorks Ltd at Takanini. I, and my adult family have a number of Peugeots and Citroens. Raj has worked on many of them, from regular servicing, to larger maintenance and repair jobs such as cambelt/water pump replacements and electronic/electrical issues, to, in the case of a couple of racing cars, complete engine strip downs and rebuilds. Raj really knows his stuff. He is quick to diagnose problems and fixes them quickly, efficiently and with an eye to the best financial outcome for the customer. He has some quite advanced diagnostic gear and uses it effectively. I strongly recommend that anyone with a Peugeot, Citroen or other European car saves themselves a lot of time and hassle by using Raj’s expertise. A recent example: My daughter’s Peugeot 307 broke down on the North Shore. She had it towed to a well recommended workshop not far from where the car had stopped. They gave it a good shot but $600 worth later the problem remained. I took the car to Raj who almost instantly diagnosed the electrical problem and fixed it at less than half the cost charged by the North Shore outfit. My daughter was much happier (especially as I paid). At the personal level I have found Raj to be always pleasant, helpful and straight forward. I trust the advice he gives me, even when it involves spending quite a bit of money. I have no hesitation in recommending him.